The audio of Trivikram’s A..Aa is out in the market now. Let’s see whether Mickey J Meyer has managed to live up to his expectations or not. Analysis : The album kicks off with the song ‘Ya Ya’ which is a fun village number. The song hits you instantly with its unique composition and the classical touch it is given through the chorus is superb. The lyrics are Indian and the earthy singing will make you love the song even more. What’s more interesting is the way different moods of the village atmosphere are gelled into one. Analysis : The second song in the album is Rang De which showcases the heroine and her quirky nature. Ramya Behera adapts to the mood of the song supremely well and makes the composition quite lively. Ramjogayya Sastry’s lyrics are light hearted and elevates the character nicely. This song will hit you more once you watch Samantha and the beautiful visuals on screen. 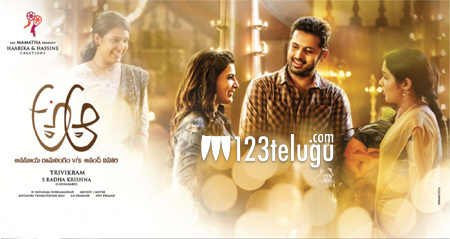 Analysis : Moving on, the third song in the album is Anasuya Kosam. Even though this number starts off on a simple note, the English rap and beautiful singing in between by Karthik makes this situational song slightly better. Analysis : The fourth song in the album is Mummy Returns which is quite an interesting number. The composition and the western touch this song has makes it different from the rest. The catch phrase and the astonishing singing by Shravani Bhargavi makes this number quite intriguing. Analysis : The album sums up with the beautiful number Yellipoke Syamala. Sung extremely well by Karthik, this is probably the best break up song in the recent times. Right from the simple tune to the soulful lyrics, this song registers with you at once making it an instant block buster. The album of A..Aa is not the regular commercial music which you listen to these days. Every song has soulful lyrics and Mickey J Meyer has composed the tunes keeping every situation of the script in mind. Ya Ya, Yellamake Syamala and Rang De are our picks and will surely grow on you once you listen to them multiple times.